Yeovil Town slipped closer to the League Two relegation zone as they were beaten by Newport County at Huish Park. 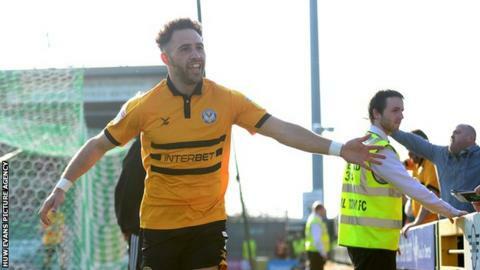 After a goalless first half, Robbie Willmott broke the deadlock for County after 62 minutes when he headed in Ben Kennedy's cross off the post. Four minutes later Kennedy got a goal of his own, when his long-range effort beat Nathan Baxter in the Yeovil goal. Welshman Tom James pulled a goal back for Yeovil before Keanu Marsh-Brown's injury-time strike sealed victory. County, who avenged a 6-0 defeat in the reverse fixture, move up to 11th, six points off the play-offs with a game in hand. Yeovil are now level on points with Notts County and only out of the bottom two on goal difference. "I thought we were solid and compact in the first half, we knew we would grow into the game. "We took control and in the second half there was only one team in it. "Some of our attacking play was unbelievable. "We have games in hand so we have got a fighting chance, so far so good. There will be some twists and turns before the end of the season." Match ends, Yeovil Town 1, Newport County 3. Second Half ends, Yeovil Town 1, Newport County 3. Corner, Newport County. Conceded by Bevis Mugabi. Attempt missed. Adebayo Azeez (Newport County) right footed shot from the centre of the box is close, but misses to the right. Ben Kennedy (Newport County) wins a free kick on the left wing. Goal! Yeovil Town 1, Newport County 3. Keanu Marsh-Brown (Newport County) right footed shot from the right side of the box to the top left corner. Josh Sheehan (Newport County) wins a free kick in the attacking half. Substitution, Yeovil Town. Francois Zoko replaces Alex Fisher. Mickey Demetriou (Newport County) wins a free kick in the attacking half. Courtney Duffus (Yeovil Town) wins a free kick on the left wing. Substitution, Newport County. Adebayo Azeez replaces Jamille Matt because of an injury. Delay in match Jamille Matt (Newport County) because of an injury. Courtney Duffus (Yeovil Town) wins a free kick on the right wing. Attempt saved. Keanu Marsh-Brown (Newport County) left footed shot from outside the box is saved in the centre of the goal. Corner, Newport County. Conceded by Nathan Baxter. Attempt saved. Robbie Willmott (Newport County) left footed shot from outside the box is saved in the top centre of the goal. Goal! Yeovil Town 1, Newport County 2. Tom James (Yeovil Town) right footed shot from the right side of the six yard box to the bottom left corner. Assisted by Tristan Abrahams. Substitution, Newport County. Matthew Dolan replaces Joss Labadie because of an injury. Substitution, Yeovil Town. Courtney Duffus replaces Sessi D'Almeida. Goal! Yeovil Town 0, Newport County 2. Ben Kennedy (Newport County) right footed shot from outside the box to the top right corner. Substitution, Yeovil Town. Tristan Abrahams replaces Gabriel Rogers. Attempt saved. Sessi D'Almeida (Yeovil Town) right footed shot from outside the box is saved in the centre of the goal. Goal! Yeovil Town 0, Newport County 1. Robbie Willmott (Newport County) header from very close range to the bottom right corner. Assisted by Ben Kennedy. Substitution, Newport County. Keanu Marsh-Brown replaces Harry McKirdy. Harry McKirdy (Newport County) is shown the yellow card for a bad foul.